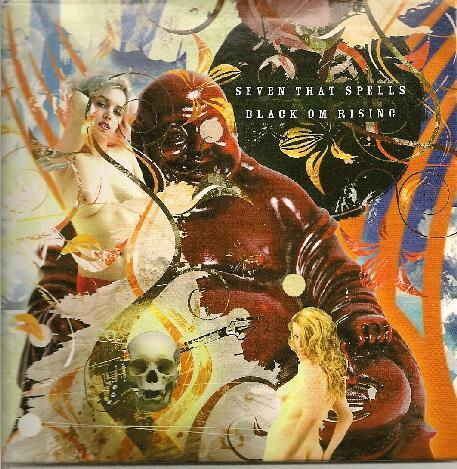 Seven that Spells - "Black Om Rising"
The lastest from Croatian psych monsters Seven that Spells is a two sided disc, one side being a CD with the album, and the other being a DVD with live performances of tracks from the album. "Fluxion" is first and opens with Acid Mother's Temple styled freakout synths… but this is different from previous Seven that Spells albums. The band launch into a prog-punk-acid jam, with killer bass work and Nico playing both melodic guitar lines and whacked out ripping psych leads. Very intense. "RA" is next and has thrashing jams and spaced out efx'd sax solos. "LO" Parts I-III begins with dreamy but frantic guitar stumming, backed by increasingly manic (and damn good) drumming. This leads into the punked out but proggy bass that I dug so much on "Fluxion". Imagine Ruins with guitar… that's kind of what this reminds me of. Avant-prog psych thrash. Intense, electrified, a level of complexity, but with a PUNK attitude. And Niko goes ballistic on guitar. And with Part III the sax takes front and center as the rhythm section pounds away, and getting into seriously freaked out psychedelic free-jazz territory. The title track is a droning psychedelic-jazz piece, capped off with a cool prog-thrash finale. "Daktari" is my favorite track of the set. Like King Crimson meets Acid Mothers Temple. The ultimate in free-wheeling Prog-Psych. And, finally, "Tearjerker" is another wild prog-thrash-psych jam that works itself into a delirious frenzy. Not only is this one of the wildest rides of the set but it may be the most compositionally intricate. But it just lasts less than 3 minutes, before veering off into an ambient experimental soundscape drift that winds down the set. The energy level on this album is off the map, and even though it's only 40 minutes long you'll feel in no way deprived. I'm thrilled to hear another side of Niko's musical interests, as he's an incredibly talented musician. And don't forget to flip the CD over to the DVD side for live performances of much of the album (It's all regions). If you're not yet familiar with Seven that Spells… you need to acquaint yourself.